Guyana’s rainforest is home to a wide variety of rare and exotic species. Back in March we took a brief look at four of the area’s animal inhabitants that you might expect to encounter on a jungle survival adventure. In addition to jaguars and brightly coloured frogs, however, a whole host of fish, amphibians and reptiles are hidden by the country’s many waters. It goes without saying that the majority of these creatures aren’t ones you’d find in your local village stream, or even in the largest of Europe’s rivers, for that matter. Here, we examine Guyana’s river species, and include some useful pointers for anyone who might encounter them. First on our list is one of the world’s most infamous fish. Its name strikes fear into the hearts of travellers and locals alike, but is its vicious reputation entirely deserved? Whether the piranha attacks out of primal instinct, hunger, or solely in self defence is a matter for some debate. A number of experiments have occurred where people have waded into piranha-infested waters with a piece of meat, and have left unscathed. While we’re not suggesting that you follow their example, it is certainly interesting that one of the rivers’ most notorious villains might not be as malevolent as many would believe. 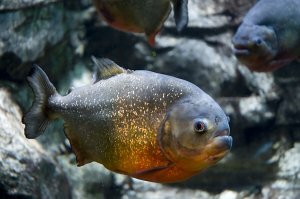 With that said, piranha possess incredibly sharp teeth, and are more than capable of causing their targets some serious damage. Our advice to you is to, wherever possible, stay out of the rivers. If you do find yourself in water during your jungle survival trip, causing as little disturbance as possible is most likely to keep you free of any piranha attacks; they’re unlikely to trouble you unless you disturb them or start to panic. 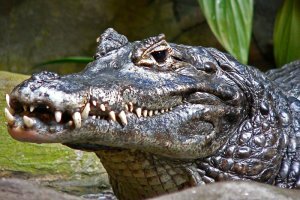 Another classic villain, the caiman is commonly confused with crocodiles. In truth, caimans are more closely associated with alligators; they’re smaller, but in many cases more aggressive. They’ll often cruise just below the surface of the water, or relax at the edge of the river. Should you encounter a caiman during your jungle survival expedition, do what you can to stay out of its way. The reptile is far more likely to become aggressive towards you if you disturb or threaten it, so steering clear of them wherever possible reduces the chances of that happening. In stark contrast to our two aforementioned species, the giant otter is, arguably, one of the most well-loved mammals in the world. Its innocent, lovable appearance makes the giant otter particularly endearing to anyone lucky enough to see one. 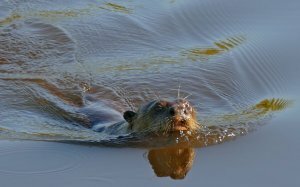 It is important to remember, though, that the giant otters of Guyana are wild animals, constantly fighting for survival. Their playful exteriors hide two rows of exceptionally sharp teeth and four sets of unforgiving claws. Keep your distance, and they won’t cause you any harm; they’re certainly more afraid of you than you are of them. They will, however, defend themselves and their young with ferocity, so you’ll have to make do with observing them from a distance if you happen to spot any. Back to our fish, and this example is, perhaps, one of the most magnificent creatures Guyana’s rivers have to offer. The Arapaima is enormous. Commonly, they weigh over 275lbs, and are over two metres in length. Centuries ago, these fish were almost double the size they are today; unfortunately, they have suffered from over-fishing and are far less common now than they used to be. In all honesty, it’s unlikely that you’ll see an arapaima during your jungle survival adventure. They seldom show themselves, except for when they break the surface to breathe: yes, they’re a fish, but do require air! They can be helpfully identified by this habit, as well as by their their red tails and incredible size. 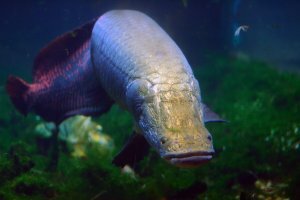 Thankfully, the arapaima prefers fish and crustaceans for their diet. Provided you don’t go looking for a fight, they won’t cause you any trouble. The final river-dweller on this particular jungle survival species list is a fascinating one. 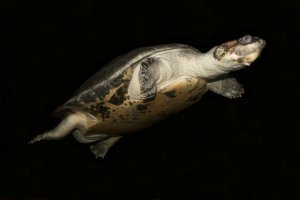 The giant river turtle, or arrau turtle, can reach well in excess of a metre in length. Your best chances of seeing one of these beasts is by watching the shores. Females will often be seen coming onto land to lay their eggs. They won’t come anywhere near you, though, if you’re anywhere visible. Thankfully, you’re in the clear with these reptiles, should you spot any on your jungle survival trip. Their diet consists entirely of plants, so they’re not a risk to humans. In case you hadn’t realised already, though, it’s generally safer to stay out of Guyana’s waters. There are a number of potentially dangerous species that should be avoided. We could go on for so much longer. There is, truly, an abundance of fascinating life in the rivers of Guyana. With well over 200 species of fish in our rainforests’ rivers, though, we would have to be here for a long time to cover everything you might find. Clearly, precautions to protect both you and these animals are necessary before you arrive in Guyana. Bushmasters are here to equip you with the necessary skills and knowledge, should you encounter any of the jungle’s wild animals, before you’re left to fend for yourself. If you think you’d be up to the challenge, head over to our jungle survival or contact page for information on how to book onto one of our adventures.